Circle Quilting! WIP. Pattern is Carolyn Friedlander's Bull Eye from her book Savor Each Stitch. Photo is of one quadrant of the quilt. One of my goals this summer is to learn to quilt circles. It's been an elusive goal until recently. I started with quilting concentric patterns. My Modern Hexagon Quilt was my first success. I started in a block with a single hexagon and quilted a hexagon pattern starting there and extending it across the entire quilt. That was fairly easy because the hexagon sides are straight lines so I could just follow along with my walking foot. Just for fun, I went around each of the appliquéd hexagons rather than going across them. When I showed the quilt at the August Boston Modern Quilt Guild meeting and they picked right up on detail and thought that was great. That worked out so I decided to try circles on my Portholes quilt. I started with the walking foot but kept getting off course because I couldn't figure out how to align the foot with the circle after quilting the first ring. I did a bit of unsewing and then tried again using free motion. That was a disaster. More unsewing! Since I knew I could quilt free motion spirals, I just went with deliberately wavy spirals. It worked, but it hadn't achieved my goal of quilting perfect circles. About this time, I saw Judy Durant's "Filtered Sunlight", her Modern Quilt Guild Michael Miller Fabric Challenge quilt. Wow! What a beautiful quilt. Her perfect spiral quilting is amazing. Judy's great quilting encouraged me to continue my quest to learn to quilt in circles. 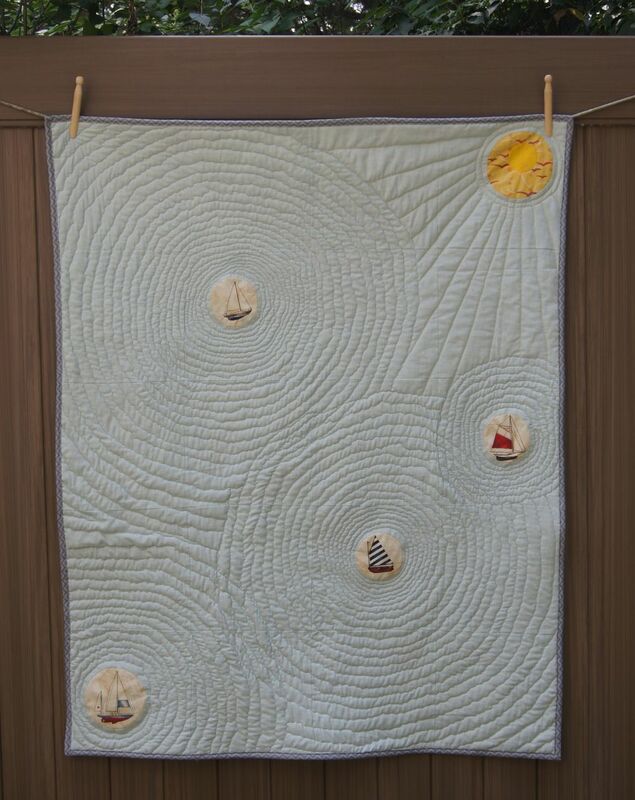 Click the link (the quilt's name) and look at her quilt posted on Amy Friend's DuringQuietTime blog. Isn't Judy's quilt beautiful? I figured it was time for a lesson, so I signed up for Jacquie Gering's "Creative Quilting with your Walking Foot." Her teaching style is lots of fun. I picked up some good tips from her. Do what you need to get the job done. (She's used a paperclip to make a guide for walking foot that didn't come with one)! Let the walking foot and sewing machine feed dogs do the work. No pushing or pulling! I also looked around for tutorials and found Karen Anderson-Abraham's great Quilting Concentric Circles Tutorial on her Blooming Poppies: Modern Designs blog. From her I learned that it's best to start quilting a larger circle and move outward using a walking foot. She recommends using a free motion quilting for the little inner circles. She uses the bowl of her food processor to mark the first circle! It's a good size and you can see your center starting mark through the hole in the center of the bowl. Ingenious! She recommends using the edge of the walking foot or the guide bar to follow the circles. With all this good information, I sat down with a sandwich of 2 pieces of felt. This is a great technique. It mimicks a quilt sandwich without needing fabric or batting. (I don't know where I read about this so I don't know who to credit. But thanks!). I drew a circle using a pottery bowl and tailor's chalk. I used that circle as my first circle and followed the marked circle with my machine's needle. I used that quilted circle as the guide for the second circle. I kept my eye on the side of the free motion foot to align to the initial circle. It works! I realized it would be easier if I marked the spot on the walking foot to help my eye focus. Like Jacquie said, "Do what you need to do." I used a felt maker to put a red spot on my walking foot. I keep the red mark on the walking foot aligned with the stitching on the previous circle. It really does help. Red mark on the left edge of walking foot. 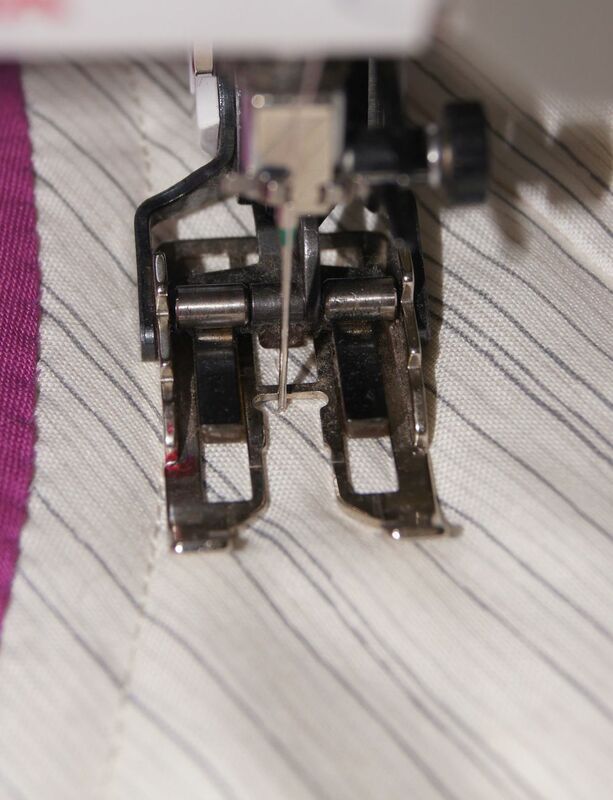 Set the sewing machine's speed at the half-way point or whatever speeds feels comfortable for you. Use the needle down position for turning if your machine has that option. Overlap the stitches at the end of each circle to lock them. Each circle has to be quilted separately. I recommend that you bury the cut threads for the best appearance. If you use a self-theading needle it's easy and quick. If you don't want to stop with each circle, quilt a spiral pattern like the one on Judy Durant's quilt. Both ways look fabulous! Here's a couple second video of using the walking foot to quilt circles. (FYI-The video links shown at end of the clip were added by YouTube. The price of free video clips I guess). Jacquie Gering sent me a message in the Craftsy class forum telling me that I would be able to master circular quilting. She was right-- mission accomplished! Admittedly the quilting I'm doing on the Bull's Eye quilt isn't covering the entire quilt, but I know I could if I want to. More about the Bull's Eye Quilt in an upcoming post!